Mark Kelly is convinced Pompey Academy can bounce back from Tuesday night’s FA Youth Cup loss to Bolton with a victory at home to Exeter on Saturday (11am). The Blues youngsters will be back in Youth Alliance League south west division action on more familiar footing at Furze Lane. The hosts were beaten 1-0 by their Premier League under-18 counterparts under the lights at Fratton Park earlier this week but had several chances to level the tie in a spirited second-half display. 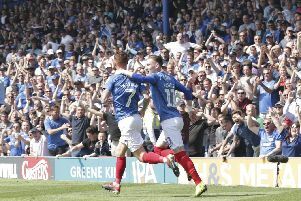 They will now be keen to return to winning ways, following two successive defeats, having lost their last league outing in a 5-4 thriller at Oxford. The Blues had previously enjoyed a 10-game unbeaten run in all competitions. Academy boss Kelly believes his squad can take encouragement from their second-half display in the cup tie and return to winning ways this weekend. He said: ‘In the second half we controlled the game against Bolton. ‘But it was one of those matches where the ball just wouldn’t go in the back of the net. ‘The lovely thing is we have this game to go and put things right. ‘The players don’t have to wait a week or two weeks for the next game, we can go and put it right on Saturday by playing well and scoring goals and going and doing all the things we’ve been doing well. ‘Bolton were a strong, physical side but the second-half performance just showed the ability some of the players have. Having made his senior Blues debut against Accrington last weekend, Academy top scorer Conor Chaplin returned to youth-team duty on Tuesday night. The promising youngster may well be in contention for another first-team opportunity against Cheltenham this weekend and Kelly praised the 17-year-old’s attitude. ‘He played 90 minutes against Bolton, so we’ll gather as a staff before the weekend and go through the process and see where he is,’ said Kelly. ‘Conor has his feet on the ground, he loves playing the game and it doesn’t matter where it is or who it’s for. ‘After the Bolton game he was upset in the changing room because he didn’t score. ‘That’s the way he is and the way he should be. ‘He’s a centre-forward and he knows he needs to score goals. ‘Whichever team he’s put with, he will do his best, he’s no problem in that regard. Pompey Academy have no fresh injury concerns going into this weekend’s clash with the Grecians.